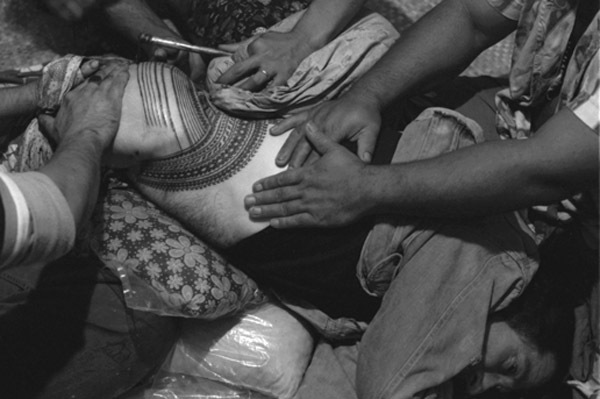 Tatau has been successfully exhibited in New Zealand, Australia and Canada. The exhibition last showed at the Ontario College of Art and Design Professional gallery in Toronto in 2008 and will open at the Museum of Anthropology University of British Columbia in early 2009. The exhibition is available to additional North American venues after August 2009. It will travel to the University of Cambridge in the UK in 2010. 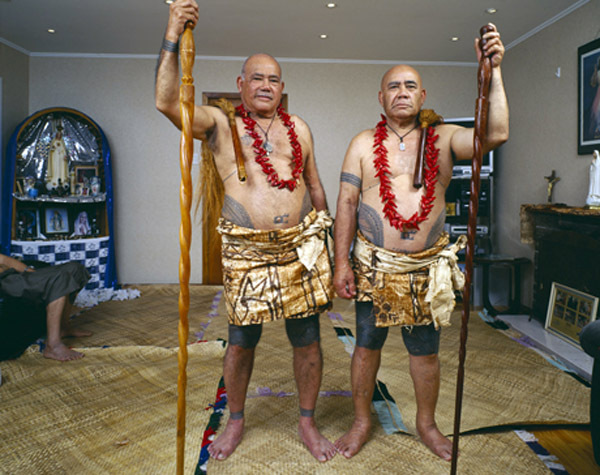 Tatau is a major photographic exhibition by Mark Adams, one of New Zealand’s leading contemporary photographers. 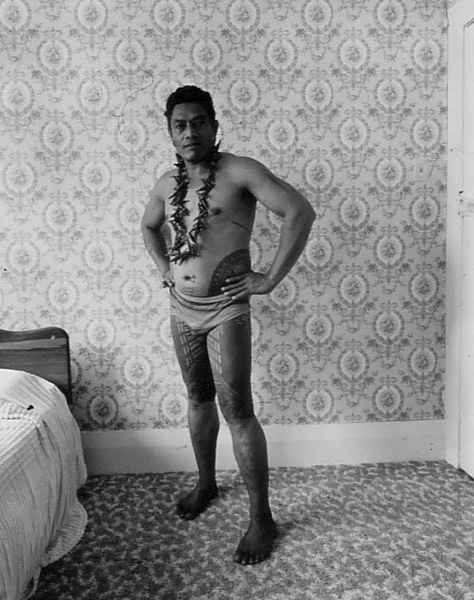 Since 1978 Adams has documented the practice of Samoan tattooists in a series of portraits and ‘genre’ studies of the tattooing operation, set in domestic suburban interiors. 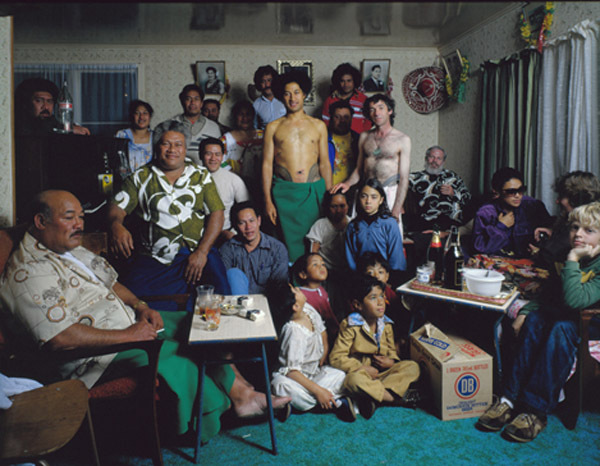 The project is one of several photofiles in which Adams has developed a personal response to the legacy of colonial history in Aotearoa New Zealand and the wider Pacific. 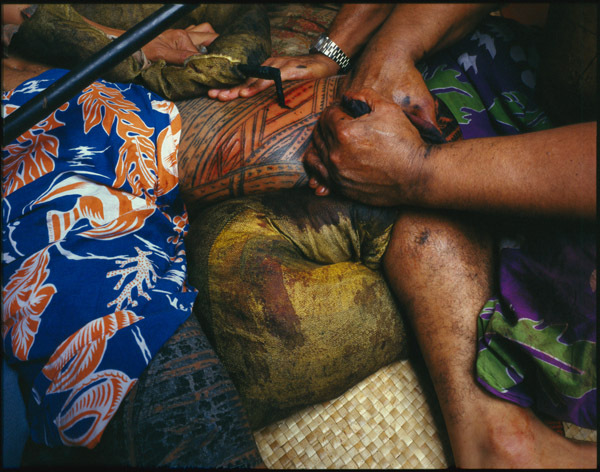 Based on a twenty five year association with the tufuga tatatau (tattoo artists) of the ‘aiga Sa Su’a (a titled tattooing family), and in particular on the friendship of tattoo master Sulu’ape Paulo, Tatau is an intimate record of the dynamism and complexity of Samoan tattooing today. 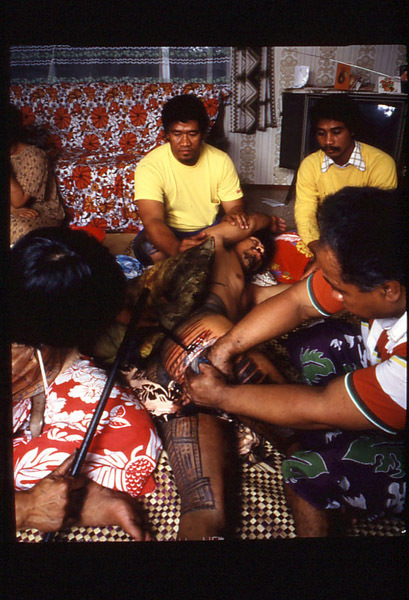 Traditionally, young men acquired the marks of the pe‘a, the male tattoo named after a bat known as the ‘flying fox’, as a rite of passage into manhood – a function it still to some extent serves. 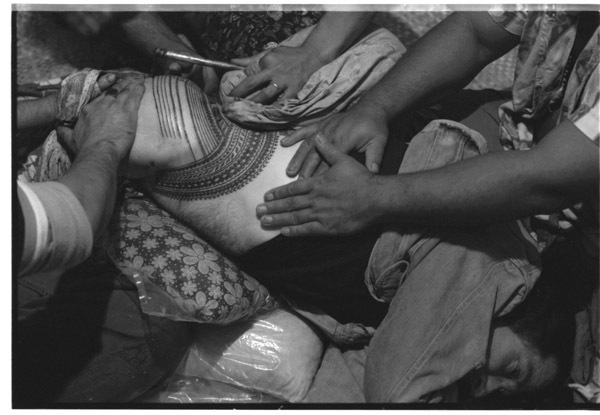 Tatau, however, portrays this practice responding to the imperatives of identity in the Samoan diaspora, which now has large immigrant communities in New Zealand, Australia and the United States. 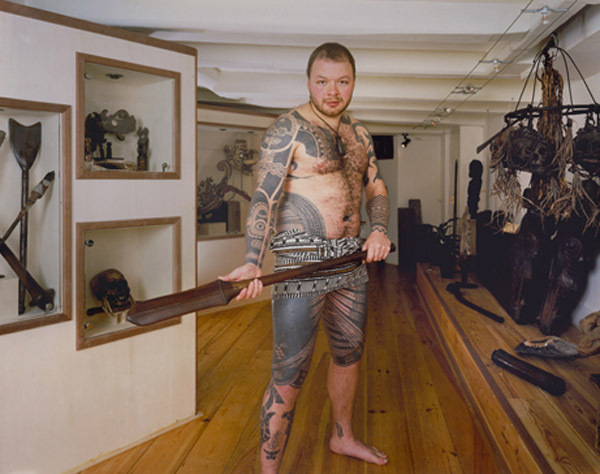 It also demonstrates the continuing fascination with the tradition by non-Samoans, exemplified in the tattooing of New Zealand artist Tony Fomison in 1979 and the Dutch tribal art dealer Michelle Thieme in 2000. 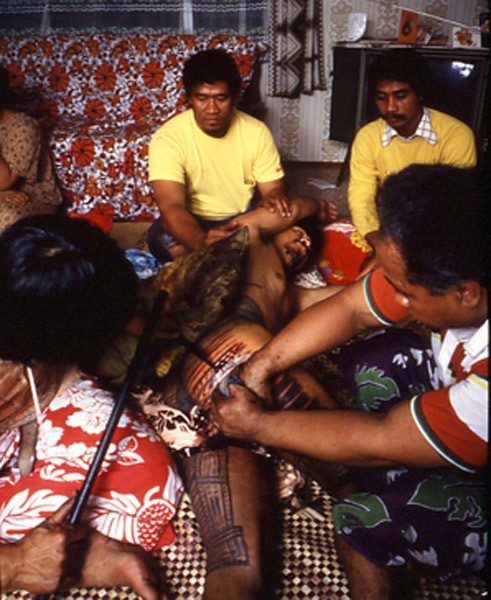 Today, Samoan tufuga manage global tattooing practices for an international clientele, from Apia to Amsterdam. First shown at the Adam Art Gallery in Wellington New Zealand in 2003, Tatau is one artist’s intimate dialogue with the rich archive of imagery that has been produced since Europeans and Pacific peoples first encountered each other. It is a subtle commentary on the history of ethnographic portraiture and the ethics of cross-cultural representation. Through recurring tropes of the room (with their fascinating contents), the other person, and the ordeal of tattooing, Tatau is a sustained meditation on place and identity, memory and colonial history. 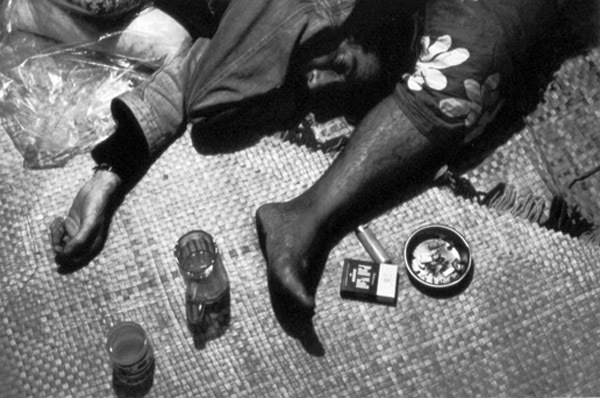 Mark Adams is one of New Zealand’s most distinguished documentary photographers. 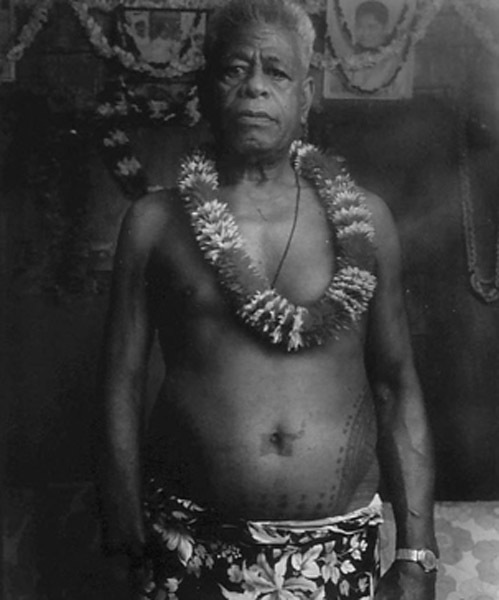 His work on Samoan tattooing, Cook’s sites, Maori-Pakeha interactions, and historic sites around the South Island of New Zealand have been extensively exhibited within New Zealand, and in Europe, Australia, Canada, South Africa, England, and Brazil. (A number of works in this exhibition were included in the 24th Bienal de Sao Paulo, selected by the curator for Oceania, Louise Neri). His publications include Pakeha-Maori: A Conjuncture (1986), Land of Memories (with Harry Evison, 1993) and Cook’s Sites: Revisiting History (with Nicholas Thomas, 1999). Adams is a full time practicing artist based in Christchurch and Auckland, New Zealand. This exhibition was by Dr Peter Brunt, Senior Lecturer in Art History at Victoria University of Wellington, and Sophie McIntyre, former director of the Adam Art Gallery at Victoria University of Wellington. The exhibition is accompanied by a 32-page, illustrated colour catalogue that includes an interview with Mark Adams by Peter Brunt and an essay by Tusiata Avia, writer and poet. 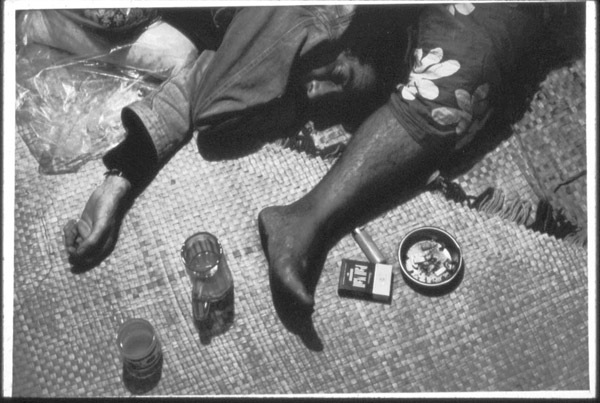 A book on Mark Adams’ photographs of tatau will also be published by Te Papa Press of the Museum of New Zealand in early 2009. 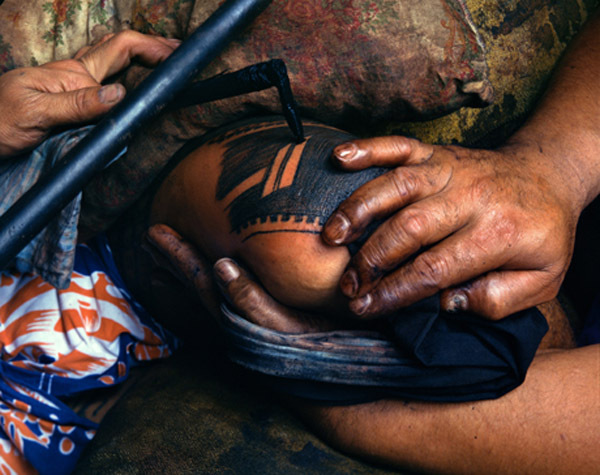 Entitled Tatau: Samoan tattooing/New Zealand art/global culture, the book is edited by Sean Mallon, curator of Pacific Collections at the Museum of New Zealand/Te Papa Tongarewa and Professor Nicholas Thomas, Director of the Museum of Archaeology and Anthropology at Cambridge University. It will feature over 80 full colour images from the series and will include essays by Mallon and Brunt as well as interviews with Mark Adams and Su‘a Sulu‘ape Paulo. The Adam Art Gallery Te Pataka Toi is a purpose-built public art gallery that has developed a reputation for its innovative exhibition and event programme which positions it at the forefront of cutting-edge contemporary art and interpretation. The gallery provides a changing programme of local, national and international exhibitions and also manages the Victoria University of Wellington Art Collection. This entry was posted in Past Tours on January 1, 2008 by Admin. Approx 85 running metres or 279 feet (although exhibition can be tailored to suit space).